What’s not to love about a snickers chocolate bar? They are the perfect combination of sweet and salty. They have the satisfying crunch of the salty peanuts and then the sweet gooey nougat. Then when added to a classic choc chip cookie recipe, they make for the most addictive cookie ever! Here comes the test of my will power again! 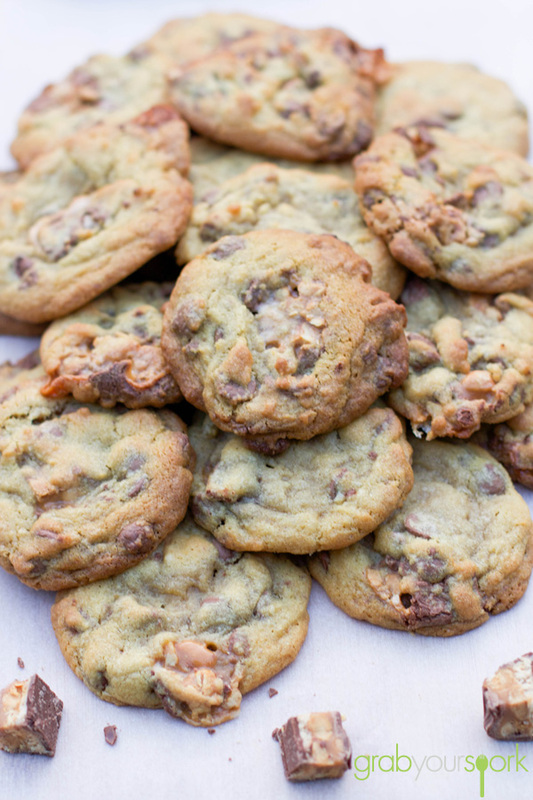 These choc chip snickers cookies are too tough to resist. The base to this recipe is a classic choc chip cookie recipe that is very straight forward. To start you need to cream the butter, eggs, sugars and vanilla well. This kept Brooke happy as it meant she got to use her kitchen-aid again! After beating the ingredients for about 5 minutes. Add the dry ingredients and mix until just combined before adding the snickers and choc chips. The beauty of this recipe is you can choose to substitute the snickers with any other chocolate (Mars Bar, M’n’Ms, Milky Way etc) however, our personal favourite is making choc chip snickers cookies. The trick to keep in mind though is, before baking add extra snickers pieces to the top and sides of the cookies for extra lava explosions as I like to think of them. The other thing I love about this recipe, is chewy texture of the cookies that is always a crowd pleaser. Through adding corn flour to this recipe, it helps keep the cookies soft and light. However, the most important thing to remember is not to over bake the cookies. To ensure you have a soft chewy cookie, bake your cookies for 8 or 9 minutes. Do not bake the cookies for more than 10 minutes, even if they don’t look cooked. I guarantee the cookies will crisp when you take them out of the oven an leave to cool. As I said before, these cookies are extremely addictive. I recommend for those who have no will power like me, that you make the cookies then distribute to friends and family once you have had your fair share. If you like biscuits and cookies then try some other tasty treats including our melting moments with jam, oatmeal and raisin cookies, ginger nut biscuits or florentine biscuits. 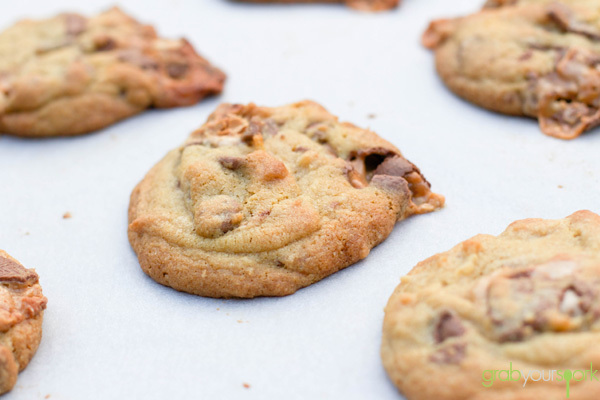 These Choc Chip Snickers Cookies are the perfect combination of sweet and salty. 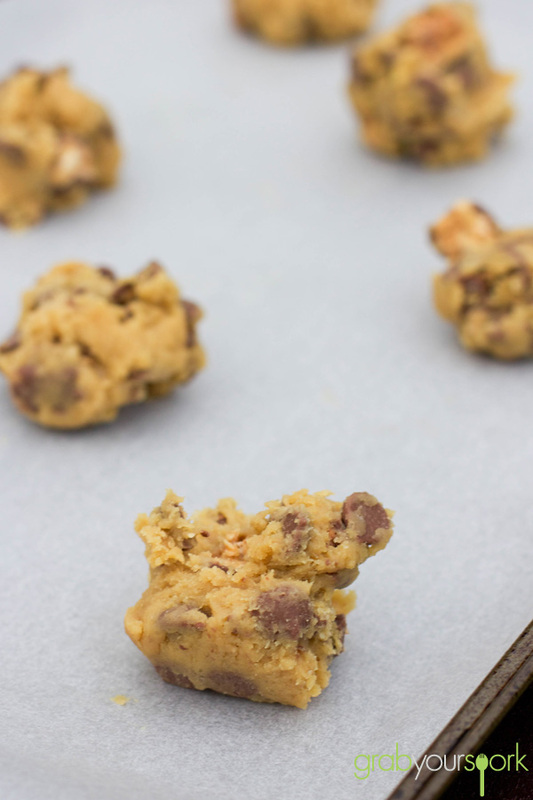 Adding Snickers to a classic choc chip cookie recipe takes indulgence to the next level. Combine the butter, sugars, egg, vanilla, and beat on medium-high speed until well-creamed, light and fluffy, about 5 minutes (or use a hand mixer and beat for at least 7 minutes). Add the Snickers, chocolate chips, and beat momentarily to incorporate, or fold in by hand. (Keep extra snickers pieces to add to dough mounds on tops and sides). Scoop the mixture into heaped tablespoonfuls on a lined baking tray. Flatten mounds slightly. Bake for 8 to 9 minutes, or until edges have set and tops are just beginning to set, even if slightly undercooked, pale and glossy in the center. Do not bake longer than 10 minutes as cookies will firm up as they cool. Store cookies in a airtight container at room temperature for up to 1 week. Alternatively, unbaked cookie dough can be stored airtight in the refrigerator for up to 5 days. If you have time, refrigerate your dough for 2 hours before baking. If you bake straight away like we did, your cookies will tend to be slightly thinner.